It protects the president of the United States and prevents him from being attacked by the revolutionaries. Use everything you need to save your life and try not to enter the White House. As you level up, you can upgrade the bodyguards and you can unlock new characters. 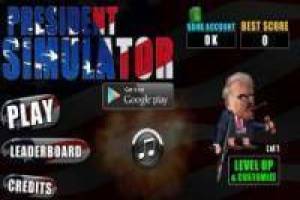 If you like Mr President games, you will surely like to save the new president of the USA. The original title of this game is President Simulator. Enjoy the game Mr President game, it's free, it's one of our presidents games we've selected.